As it was expected and rumored, Samsung announced that a new music oriented Galaxy smartphone is now available. The Galaxy Music is a small friendly device dedicated to music lovers. 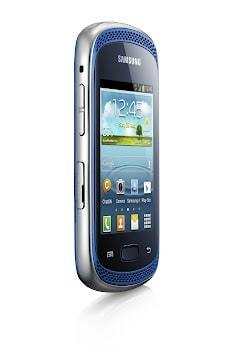 Samsung describes it like it “offers superb sound quality and superb music player features”. The intelligent device uses Android 4.0 Ice Cream Sandwich and has a “powerful processor” , not yet specified how powerful, that ensures a smooth performance. The fact that it is a device especially created for music listening means it is equipped with dual frontal stereo speakers, advanced audio features (Sound Alive and SRS), an FM radio application all together offering remarkable sound performance and an amazing experience. To enhance the music experience even more Samsung added a unique music dedicated key that allows instant access to the music player without any extra requirements. 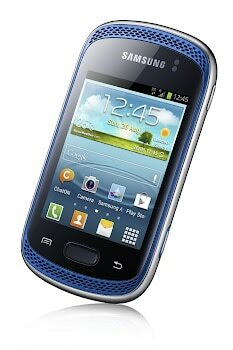 The phone features a 3 inch screen with TFT and QVGA resolution(240×320), a 3MP rear camera with no flash, Samsung hub ( Music Hub and Game Hub Lite), GPS, Bluetooth 3.0, Wi-Fi b/g/n, W-Fi Direct, 4GB internal memory allowing extra SD memory up to 32 GB and 512 MB ram. The Phone will come out in dual-Sim also. Further information about price and regional availability will probably be released near the launch date. We’ll keep you updated till then.